The CraneBoard is a low-cost, open-source hardware development platform based on the AM3517 Sitara ARM Cortex-A8 microprocessor. 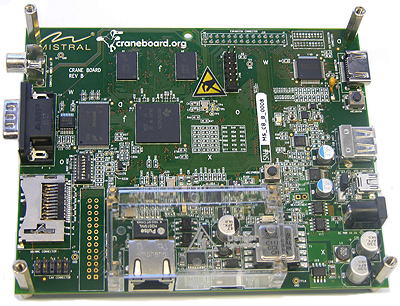 The CraneBoard was announced in December 2010, can be purchased for 199 USD and can be an alternative to the Beagleboard-xM. AM3517 is especially suited to industrial applications and would be a preferable platform if your project needs CAN or PoE support. The board has less RAM (256 MB vs. 512MB) and no camera port. Both hardware and software are open for the development board. The hardware documents (schematics, pcb layout, BoM..) are available at http://designsomething.org/craneboard/w/hardware/default.aspx and the software resources can be found at http://designsomething.org/craneboard/w/software/default.aspx. SDK are available for Android and Linux Angstrom.